We were all children. I, and probably most of the others, had just left school, aged about 14. Frightened, we all filed into a huge, high-ceilinged room with neat rows of desks facing us. We were in this strange school-like room because (expressing things in the language of our parents) we wanted to become His Majesty’s Civil Servants, His Majesty being King George V. If we passed the exam we would work as his non-political staff. I had gathered that I would first become a messenger-boy, then, when I had learned all the rules and was doing all the right things and obeying instructions, I stood a chance of being made a Senior messenger boy. After that, all sorts of wonderful things could happen and I would become one of those smartly-dressed men in pinstripe suits and bowler hats striding along London’s streets, swinging their rolled umbrellas and looking important. Personally, I was unsure about it all; I had the vague feeling that becoming important was not my goal in life. A pianist, yes. An actor, yes. A painter of portraits in a suitably untidy studio, yes. Definitely. But my father had other ideas for me and this day in 1937 (or was it 1938? ), in this room, King George V would find out if I was cut out for the job. We sat where we were told to sit. A man was standing at the front of the desks and, after a moment’s silence, he began to tell us what we were about to do. A pen and a sheet of printed paper lay on each desk and looked important. Pale faces all round me gazed at him, alert and cautious. North London traffic noises seeped through closed windows, London Underground trains, one of which had just brought me here, slowed and stopped at Colindale station, just visible from where I sat. The examination began. I dipped my pen into an inkwell that resembled the one on my desk at school, and wrote my name, the date, and my home address. Pens scratched paper, little clearings-of-throat came from round the room, unnatural, nervous. Then, oddly, I felt my eyes smarting – the sort of feeling you get in the kitchen when dinner’s being prepared and raw onions feature. I became aware that the boy next to my desk was rubbing his eyes. Then the boy in front. Then there was a murmuring of voices and the man got up from his desk at the front, from which he had been watching us, and went to the door. My eyes were watering, I felt strange. Then things happened very quickly indeed. We were bundled from the room and taken outside, handkerchieves at our eyes and asking each other what on earth was going on. Asking, and getting no replies. Tear gas? From that day to this I have heard nothing of the event. I must have asked people but the memory of the day goes hazy and I remember nothing of family discussions or of questions being asked. Recently, spurred on by growing curiosity concerning that single, isolated five-minute memory that has stayed with me for over seventy years, I have peered into the internet’s historical corners and seen replicas of the 1937-38 news items and memories of incidents and accidents. But the mystery remains. The Metropolitan Police Headquarters, I have been told, was housed at Colindale at the time, and I have been reminded that tear gas was used in the training of ARP (Air Raid Precautions) staff: war was soon to break out. Was there a training course in progress in or near the building and did a gas cylinder get set off accidentally? Or was it possible that I was being involved in something more interesting, something darker, something a 14-year-old would have been able to brag about for months, years? I never took that exam. Never got anywhere near His Majesty’s civil business. But for a couple of years I did achieve the always disputable distinction of wearing an un-pinstriped suit, a trilby hat and, rather impressively I felt, swinging a rolled umbrella as I walked along Kingsway every weekday morning and evening between Holborn Underground station and the London headquarters of Kodak Limited. This entry was posted in Autobiographical, Odds and ends and tagged children, civil servants, frightenewd, gassing, London Underground, mystery, school, strange school-like room, tear gas, watering eyes on 30/11/2012 by Paul. W ell after midnight and under a starry sky one night in 1935 I was sitting on the rear carrier of Dad’s bicycle with my arms around his waist and we bumped over the undulations at the edges of Stanmore golf course. We were on the way home after an adventure. I had just driven a London Underground train. He had decided that this was the only possible way to satisfy my constant questions about what he actually did when he went to work. He was a Driver on the London Underground railway, the Northern Line, running from Edgware in Middlesex southwards to Morden in Surrey. A date was arranged. My mother and I were to wait until a couple of hours before the end of night duty and then get a bus to Edgware and then a Northern Line underground train. We were to get out again when we reached a station – which one, I’ve forgotten but it was just a little further along the line. We were to get out and cross to the Northbound platform and watch for the train he was driving come out of the tunnel to the platform. As he slowed to a stop he would wave to us through his front widow. We then had to get into the the leading carriage, sit down and wait until he opened his cab door to take me inside. As for my mother, she was to get out at Edgware, take the next bus home, go to bed and forget all about us. So, Dad and me, alone, on an adventure. His train came roaring out of the tunnel mouth and there he was, waving. With the other waiting passengers, we got in. The cab door opened and I leaped to my feet and joined him. He shut the door and sat me on his knee. I heard all the carriage doors rolling shut. A loud bell clanged from somewhere over my head. ‘Right! First, we take the brakes off.’ He made my right hand turn the lever round to its fullest extent. The brakes were off and we were free to move. ‘And now we apply the throttle.’ My left hand and his made the Dead Man’s Handle move round until there was one click. We began to roll from the electric light of the underground platform into the tunnel. My hand was moved round to the next click, and the next, and the next, until the throttle was fully open. Eventually we were at full speed, something like 40 miles an hour. Ahead, the blackness was broken only by regularly-spaced lights in the tunnel roof, their reflection glinting along the rails that vanished into the distance. Under my father’s hands, my own held on tightly. I wasn’t going to mess things up for him; I was going to drive his train as well as I jolly well could. No messing. Ahead, a very bright, yellowish hole appeared in the blackness and was slowly getting bigger. It was the next station. He and I moved the Dead Man’s Handle back to where it had started from, and I felt the train losing speed. ‘Now, we apply the brake very gently, a little bit at a time.’ Our right hands moved the brass lever forwards, then back again, just giving the brakes a gentle touch and releasing them. Then we moved it a little further forwards, and back again. This went on until the lever had travelled to its limit and, in the bright light of the station, we rolled along at walking pace. Just a moment before the train stopped he said ‘Now back again,’ This took the brakes right off so that the train was left to roll the final inch or two to a natural stop, so that there was no sudden jerk to make standing people stagger. Then we put the brakes fully on. The train was securely held still. (Years later as I learned to drive a car I adopted the same sequence and achieved the same kind of comfortable non-jolting stops. I’ve done it ever since. Six or more stations followed and, finally, we rolled to a stop at Edgware. It was after midnight. ‘Come on up to the Mess-room!’ We galloped up a flight of iron steps into a quietly noisy smoke-filled room where half a dozen or so men relaxed between trips. Amongst friendly joking about the new driver I was introduced. They chatted with me as my father collected his coat and bicycle clips. Then, on the road, we were swerving on to his short cut journey across the edge of the dark golf course, turning off into Kenton Lane, squeaking to a halt under the crab-apple tree by the front gate of our little terraced house. His keys rattled, the front door opened and we were indoors. The house was eerily silent and we whispered so as not to wake my mother. There was some larking about as he looked for the milk jug in the larder and poured two cupsful into a saucepan, lit the gas burner and make us both a hot cocoa before bed. A ‘goodnight’ hug, and the adventure was over. 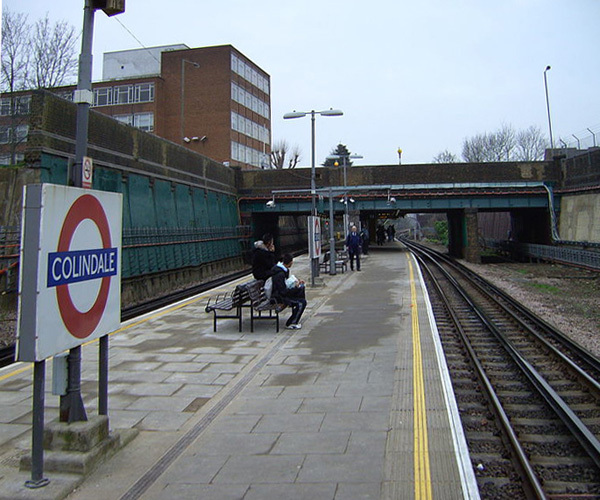 This entry was posted in Autobiographical, Vehicles and tagged adventure, bell clanged, brake, cocoa, dad, dead man's handle, edgware, late one night, London Underground, messroom, middlesex, Morden, northern line, platform, saucepan, train, whispered on 22/11/2010 by Paul.